Investing in the best golf GPS watch is a great way to slash shots off your handicap, and we couldn’t imagine going back to guessing which club to choose without the data to back it up. Wearables and golfers have long been bedfellows, and those desperate to shave a few digits off their handicap can really find benefits with technology. 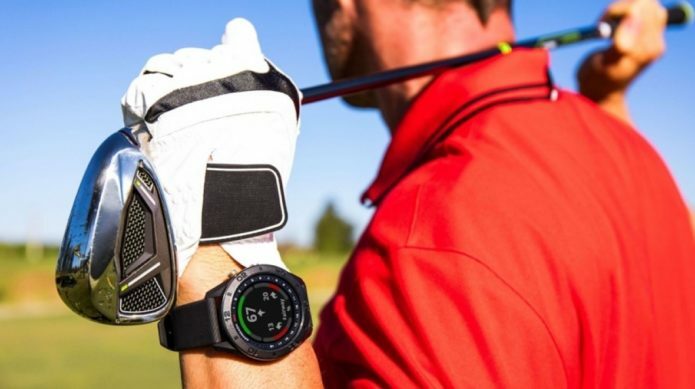 Using a GPS golf watch can help golfers make better decisions on the course, and the price of the technology has plummeted in the last year, making them affordable for everyone. It’s not just GPS watches and glorified range-finders, either. Systems like Game Golf, Arccos and Zepp are helping golfers get more out of their practice time, and both systems promise* to offer insights into your game – and most importantly, actionable information to become a better golfer. We’ve been busy testing a host of golf watches over the last few years – and it’s still Garmin that rules the roost. Increasingly, golf watches are more than just about the 18 holes, with fitness tracking and other sports features built in. 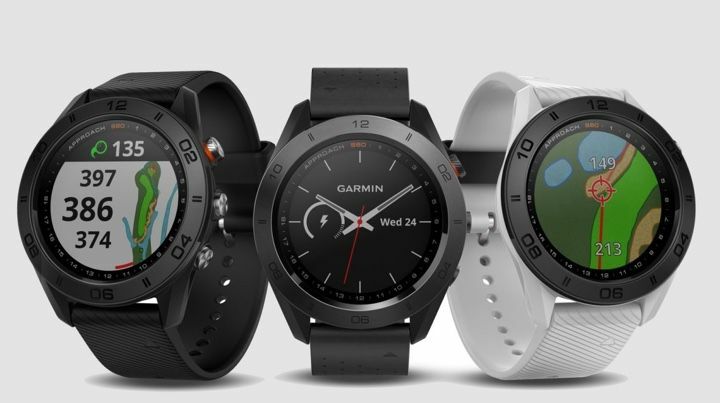 The latest Garmin Approach S60 apes the all-singing Fenix 5, to bring maximum features into one device. In terms of golf, it packs in advanced technique and swing analysis (SwingTempo and TempoTraining) of the ageing Garmin Approach S6, and pairs it with the distances, hazards, scoring and shot detection. New features include PlaysLike, which offers distances that take elevation into account, pairing with the TruSwing sensor and GPS sports tracking with a full roster of sports. 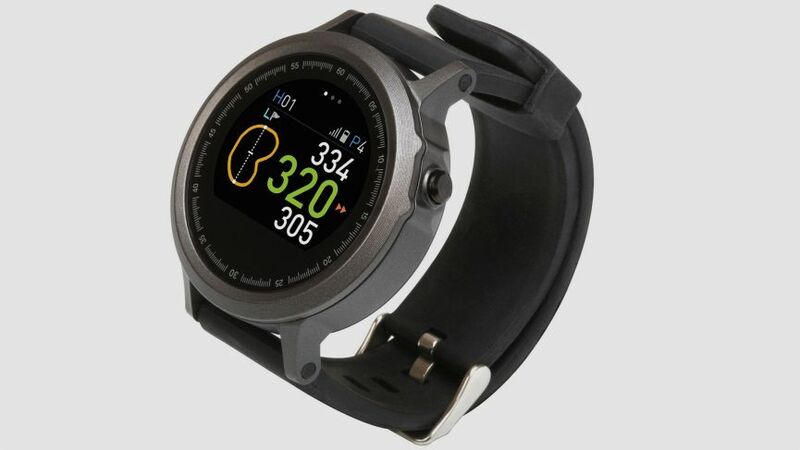 It’s essentially a Fenix 5 that puts golf first, and just as bulky, which will put some golfers off – especially ladies. It’s an incredible feature set, which in all fairness, is too much for most golfers. Most won’t want to start fiddling with SwingTempo based on the watch, and to be honest, even as experienced golfers we’re a little confused about what the stats mean, and more importantly, how to fix them. Some golfers will love getting their hands on all this data – and you certainly pay for the privilege. As regular golfers ourselves, the Approach S60 simply offers too much for too much cash – but if you want the best – there’s little out there to match it. With distance and hazard data for 41,000 golf courses worldwide, the X10 eschews the more complex features found on the likes of the Approach X40. 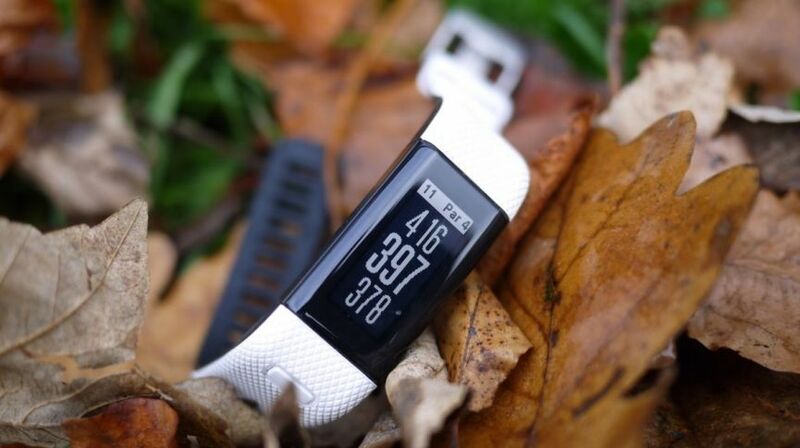 The design is more like a traditional fitness band – thin and unisex, but gone are features like swing analysis, swing tempo and integrations with Garmin TruSwing. You don’t get shot tracking and recording of shots as well as activity tracking features, heart rate and smartwatch notifications are also surplus to requirements. But all the key things you need for your round are still here. Distance to the pin, hazards including key lay-ups and dog-legs is all displayed – and you still get the exact shape of the green, where you can place the flag for exact distances. In 2018 golf watch terms these are basic features – but we rarely use more than this, and have apps such as Hole19 and GolfShake we prefer using for scoring and tracking rounds. And with a simpler feature set you pay less too. The Garmin Approach X10 is one of Garmin’s cheapest golf watches, and comes recommended. There are a lot of Garmins on this list, but the company is turning out golf wearables faster than Jason Day is accumulating titles, and they’re all very different. The Garmin Approach X40 doubles as an all-day fitness tracker and offers GPS run tracking, bolstered by 24/7 heart rate tracking that will match any Fitbit. Back to golf, it comes pre-loaded with data for 35,000 courses, which includes pin position details and hazards. It’s surprisingly easy to navigate on the small touchscreen display and there’s also a mode for measuring your drives. The Approach X40 will also track your shots – if you turn the feature on – and will subtly prompt you to tag which club you used. We found this slightly superfluous and easy to ignore, though real data golfers will no doubt love the feature. On-watch scoring is nicely implemented, and you can also benefit from smartwatch notifications delivered from your phone. All-in-all the Garmin Approach X40 is a fantastic golf watch and so much more. If you’re a passionate golfer whose active lifestyle extends beyond the course, it’s a fantastic buy. While you’ve read the best of our golf tests, there are still plenty of other options. If you see deals on the following – here’s our verdicts. TomTom has expanded its line-up of golf watches by adding the TomTom Golfer 2 SE, and it’s a serious return to form for the company. We panned the original Golfer 2 intrusive and erroneous shot detection system (since slightly tweaked) that inflated its price to $249. Well, the SE slashes cost substantially, and benefits from some subtle tweaks that vastly improves the usefulness of the data captured in the all-new TomTom Golfer app. As well as distances to the green and excellent hazard yardages, the Golfer 2 SE will detect the location of your shots and produce data on your spread of tee shots, greens in regulation and putting averages. There’s still a tendency to produce false positives, usually when putting on your bag or accidentally covering the screen, which is a shortcut to adding a shot that’s not detected on the course. 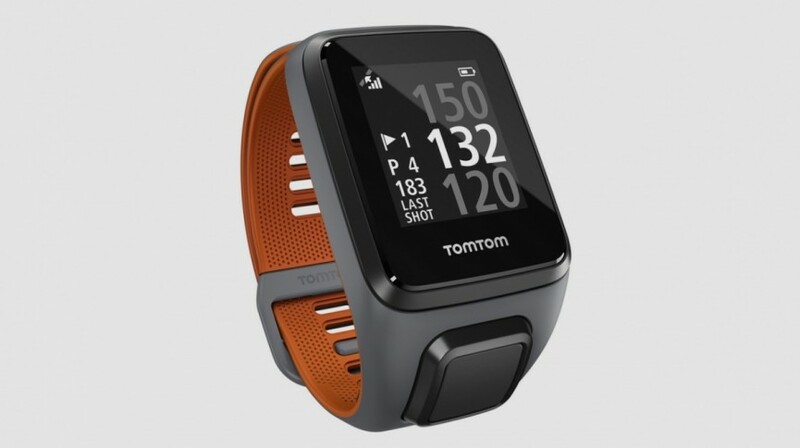 Overall, there’s plenty of reasons to choose the TomTom Golfer SE, and its price now punches alongside the Garmin Approach X40 and S20. The shot detection adds an extra element, and while we wouldn’t rely on it to replace the likes of the Arccos 360 or Game Golf, it’s capable of adding an extra dimension to your 19th hole post-mortem. 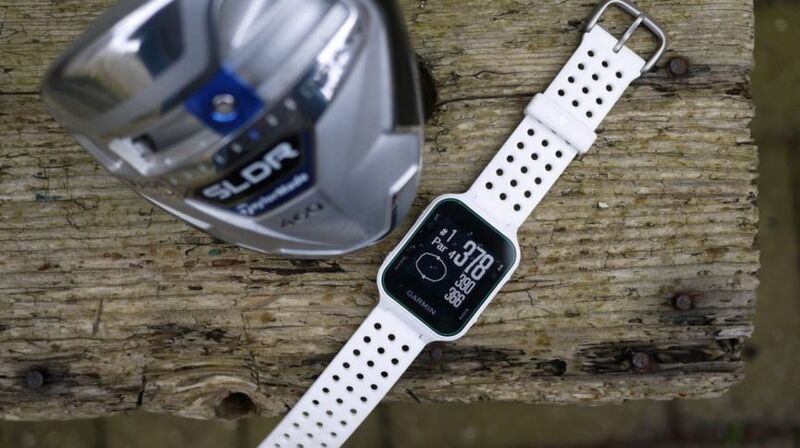 Designed to be worn away from the golf course, as well as providing GPS distances on it, the Approach S20 offers fitness tracking and smartwatch notifications. On the golf course, there’s support for 40,000 worldwide courses with distances to front, middle and back displayed next to a map of each green. 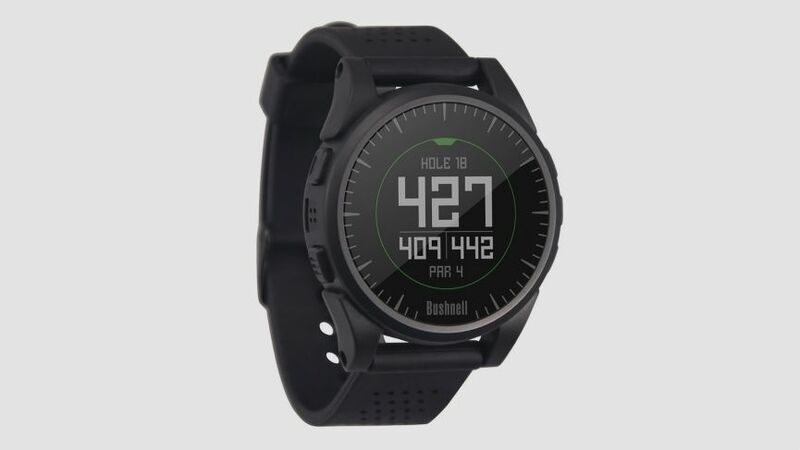 You can call up hazard and lay-up distances for any hole through the context menu, keep score on the watch using a super nifty tracker, and the watch claims to record every shot you take on the course – although we found that hit and miss to say the least. You’ll get two big rounds of golf from the battery – and up to eight weeks as a standard smartwatch. The Approach S20 hasn’t been treated to GPS tracking for workouts, nor does it boast a heart rate monitor, so it’s slightly less versatile than the excellent Approach X40. But if you prefer the watch format to the fitness band, it’s still a top golf device. Okay so it’s not technically a wearable, but Hole 19 has become a staple of the Wareable golf line-up. It turns your Apple Watch or Android Wear device into a GPS golf watch by piggy-backing off your smartphone, and while it’s not that reliable (the Apple Watch app has a nasty habit of crashing) it’s a good way to get extra value out of your smartwatch. But beyond turning your smartwatch into a golf GPS device, the smartphone app is also well worthy of a mention. 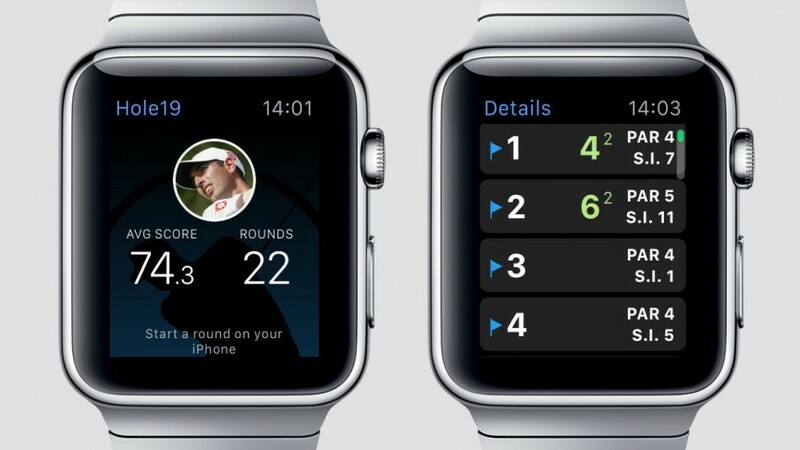 The scorecard (which can be input via the watch) is fantastic, and there’s an awesome golf community where you can post photos of your rounds and add your regular playing buddies and keep track of how they’re doing. We were really surprised with our testing of the Golf Buddy WTX – and its bright and vibrant screen is really clear to read out on the course. Distances were easy to read, and you can swipe through a host of useful stats, from hazard distances to lay-ups. It’s also bustling with GPS features for running – although don’t expect the kind of post-run analysis and top integrations of a “proper” running watch. Our only major gripe was battery life – and you’d be hard pressed to complete two rounds with the Golf Buddy WTX. It’s a decent golf experience, and did a good job of showing the right data at the right time – plus the full colour touchscreen makes it easy to flick between screens. 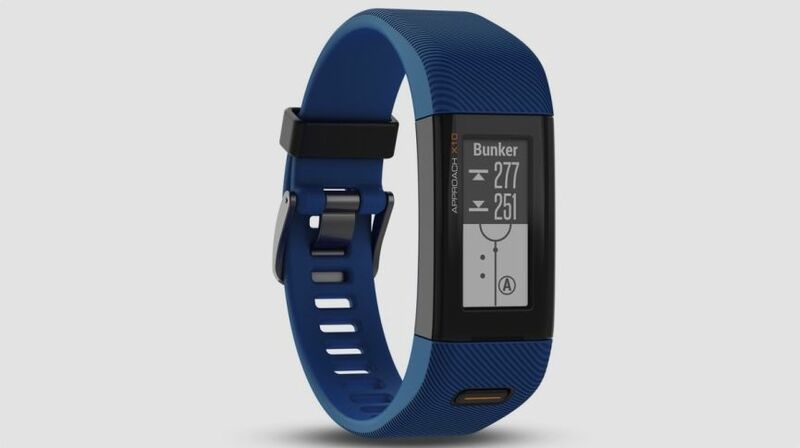 We’d recommend the Golf Buddy WTX – but given it’s the same price as the impressive Garmin Approach X40 and S20 – we’d probably edge towards those devices on balance, which just nail the golf experience a little better with both manual scorecard inputs, automatic shot detection and longer battery life. While Garmin and TomTom dominate the golf wearables market, Bushell has been in the game even longer. The Bushell Excel GPS is a pretty feature packed watch, with a digital touchscreen, 35,000 courses and a dedicated companion app. It works well and we had no beef with the accuracy, but the design of the interface is harder to read than its rivals, and the buttons on the side aren’t as responsive, which makes it a bit of a faff to use. If it was a more budget golf watch it would be a great option – but it’s hard to justify over a Garmin Approach S20 at a similar price. Supplement or try and replace a professional coach with a swing analyser, that quantifies the biomechanics of your swing, helping you make those slight adjustments. Here’s the ones we’ve reviewed. Zepp 2 is a clip-on device that attaches to your glove when you’re on the course or hitting on the range. 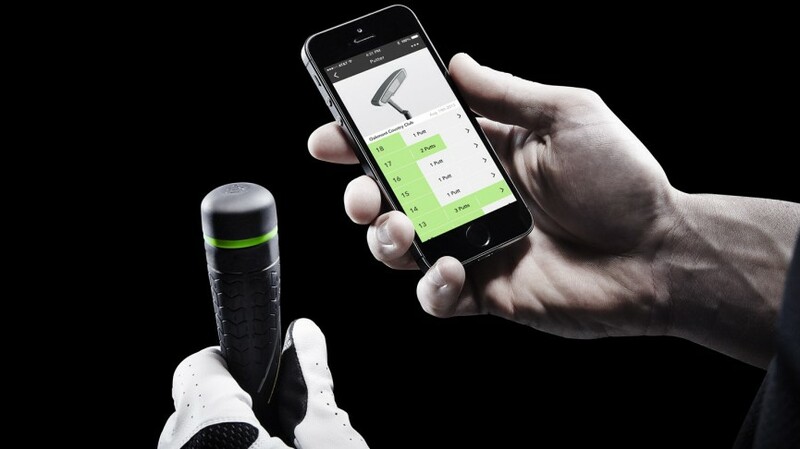 The array of sensors notes everything from the speed of your hands to the tempo of your forward and backswing, before showing your data in the app which flashes up less than a second after you’ve hit the ball. You can then review the data, look at visual charts of your shots, and even compare them to professional’s swings to see where you’re going wrong. There are also heaps of tuition videos from pros tailored to the area of your swing you’re struggling with. When paired with a smartphone, the app will even use the built-in accelerometer to track hip movements: a crucial element of a consistent swing and the Achilles heel of many a weekend golfer. 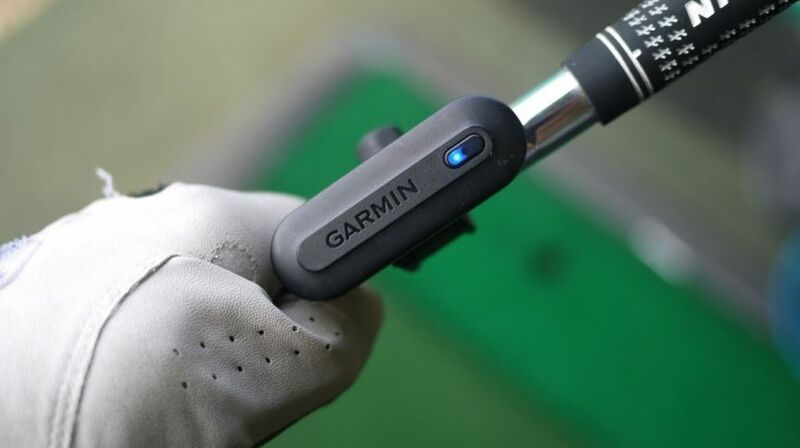 Garmin’s swing sensor takes a different tact to Zepp, and is positioned on the club shaft, rather than the glove. The steady position makes it a tad more accurate, and it picks up a host of data, from shaft angle, lean, club speed, club plane – everything you need to build up a picture of your game. But is it any good? This is quite a nuanced decision, so bear with us. In terms of raw data we found the Garmin TruSwing to be a fantastic swing tracker, but is much better if used with a regular coach. The app isn’t nearly as good as Zepp with its traffic light system of swing analysis, and the raw data can be quite impenetrable. Comparing swings isn’t nearly as easy, but if you pair it with the Approach S20 or the Approach X40, you can get data on your wrist, which is infinitely better than fishing out your phone to check your swing plane. In short, if you’re working with a coach pick the Garmin. If you just want to fix your swing down at the range, the user-friendly Zepp 2 is a much better bet. Taking the fight to GameGolf is the impressive Arccos Golf package, which uses club-top receivers to track every shot on the course. Unlike its big rival, however, you don’t need to physically tap before taking every shot, with shots automatically detected by your smartphone. In return you get handicaps derived from each aspect of your game, showing you where you can pick up shots, as well as average distances for every club. It’s not perfect, and in our testing not every shot is recognised, but it blends into the background allowing you to get back into your game. Another wearable analyser, Game Golf is brimming with professional endorsements with Lee Westwood, Graeme McDowell and some bloke called Barack Obama all using it. 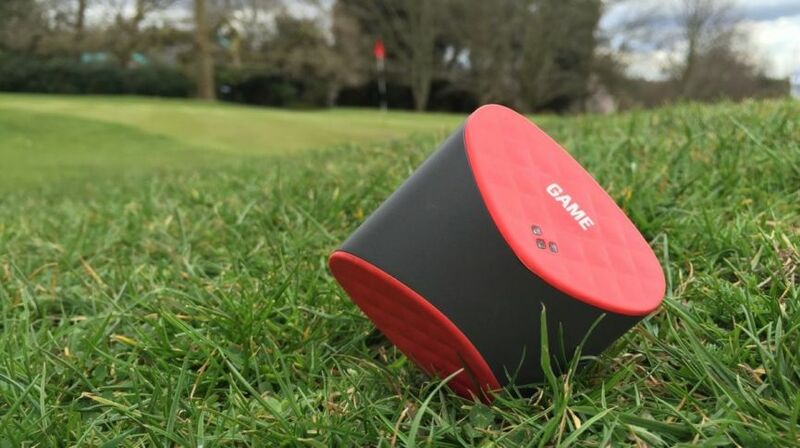 If that wasn’t enough, Game Golf even boasts design by Yves Behar, the creative director of Jawbone. Game Golf comes in two parts, a wearable sensor which mounts on your belt, and a series of sensors that mount onto the top of your club. When you’re about to play a shot just touch the club element to the sensor, then play. When you get home Game Golf shows every shot and the success rates in each part of your game, so you can identify the areas you need to work on. It’s a decent system, but we’ve never managed to include it into our game. We get so engrossed into the round – be it playing well or badly – that we forget to tap, and for our money, it’s a bit too much like hard work. But if you’re willing to build Game Golf into your pre-shot routine, the well-designed app and array of data can add valuable information to your game post-mortems. 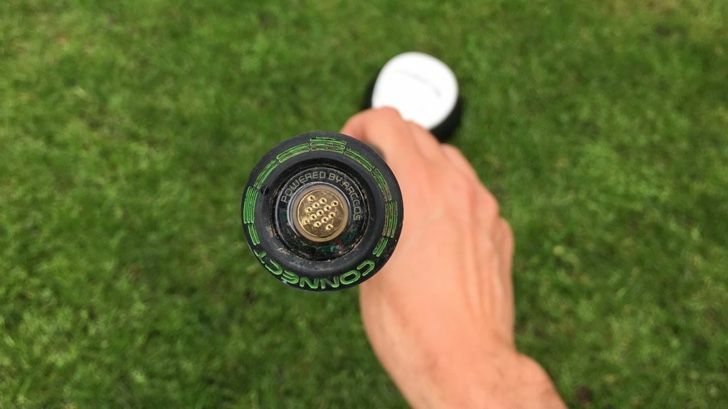 The Cobra Connect drivers feature the above Arccos technology built into the shaft, and connect to your phone via Bluetooth. You use the same app, but without having to buy the full set of screw-in sensors. While you don’t get a map of every shot you take on the course, the Cobra Connect drivers enable you to track your driving accuracy, which is a manageable way to get started. One paired with the smartphone app, the driver recognises a shot and plots it on the course map. When you take your second shot with a sensorless club, the app uses your phone’s microphone to detect the resulting shot being taken, and plots the second GPS position. This should start to demystify your driving and provide real data on your bad shots. Are they predominantly left or right? What percentage make the fairway? For many golfers, the reality is far different from the perception. The Cobra King LTD is $450 and available at American Golf now, while the Cobra King F7+ is $400 and Cobra King F7 is $350.